In 1963, young drummer Eddi Kristins from Keflavík went to England and saw The Beatles play in Bournemouth every night for a week. He came back to Iceland and told his friend, guitar player Gunnar Þórðarson, all about this amazing band. They decided to form a band of their own and got their friend Elli Björns to play rhythm guitar, Einar Jul to sing. Gunnar wanted his friend Rúnar Júlíusson to play bass. Rúnar didn´t know how to play the instrument but Gunni was determined to teach him. They started rehearsing every day, Rúnar had the new Beatles album and they rehearsed six Beatles songs and 74 other rock songs. They decided to call themselves Hljómar (The Sounds). They rehearsed for three months and got their big break when a band from Reykjavík cancelled a gig in the club Krossinn in Keflavík, with a few days notice. Rúnar turned his side to the audience all night. Most assumed it was due to shyness, but in fact he was watching Gunni who was giving him pointers on how to play the bass. They were extremely well received because of a few coinciding factors: No other band had rehearsed and played the new Beatles songs and they wore real uniforms. Rúnar had bought himself a leather vest with a red back and chrome buttons and he got his mother to sew identical vests for the other band members. Underneath the vests they wore striped Melka shirts Eddi had bought in London and black leather bow ties. Ultra cool. Their fame travelled with lightning speed across the country and that winter they were the most sought after band to play at school dances in Reykjavík. In the spring they toured the country. They switched lead singers a few times and got a new drummer, Berti Jensen, who shared lead vocal duties along with Rúnar. In the fall of 1964, the band was one of the first of the young bands in the country to sign a record deal. Bláu augun þín and Fyrsti kossinn were the first of many songs by Gunnar Þórðarson to enchant the entire population. 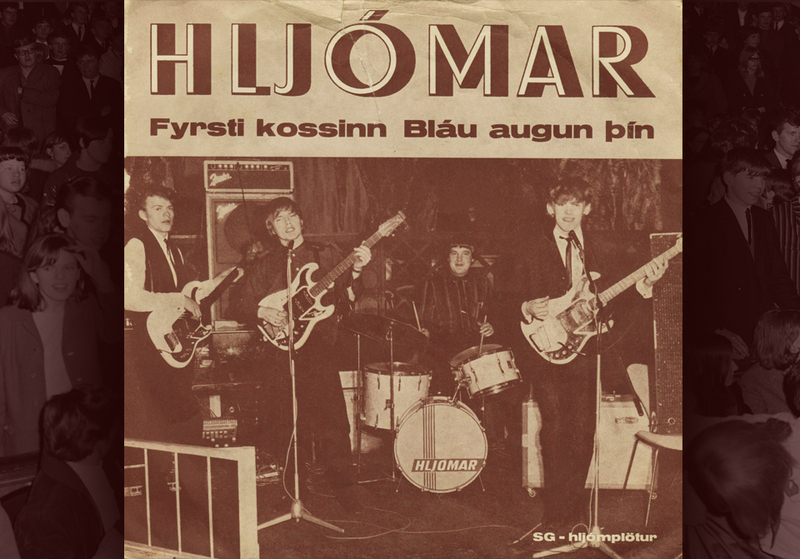 Hljómar were dominant in the Icelandic beat music scene throughout the sixties, putting Keflavík on the music map and even recording in England as Thor's Hammer. Hljómar (but they used the name Thor’s Hammer for the international market) was a band from Keflavík. Keflavík (“Driftwood Bay”) is a town in the Reykjanes region in southwest Iceland. In 1995 it merged with Njarðvík and Hafnir to form Reykjanesbær. 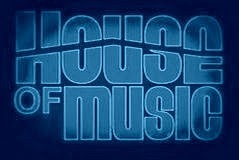 A lot of great bands come and came from this area. Maybe because people were able to listen to the Rock ‘n Roll music of the US Navy Radio Station of the military base and airport just outside town. Hljómar are often called “the Beatles from Keflavík”. The self-educated guitarist Gunnar Þórðarson, who played at first with some older guys in a band, engaged his friend Rúnar Júlíusson to play bass (for the first time) in a new band in October 1963. Hljómar started to play the latest Beatles songs with a lot of success. The Beatlemania reached Iceland in 1964, so the band (and others too) could perform and tour around the island. Band members came and went, but the only 2 always on stage were Gunnar and Rúnar. Engilbert Jensen took the place of drummer Pétur Östlund in March 1967. The Classic Icelandic Album “Hljómar” was released on 7. November 1967 on the SG-hljómplötur Label (SG-013). 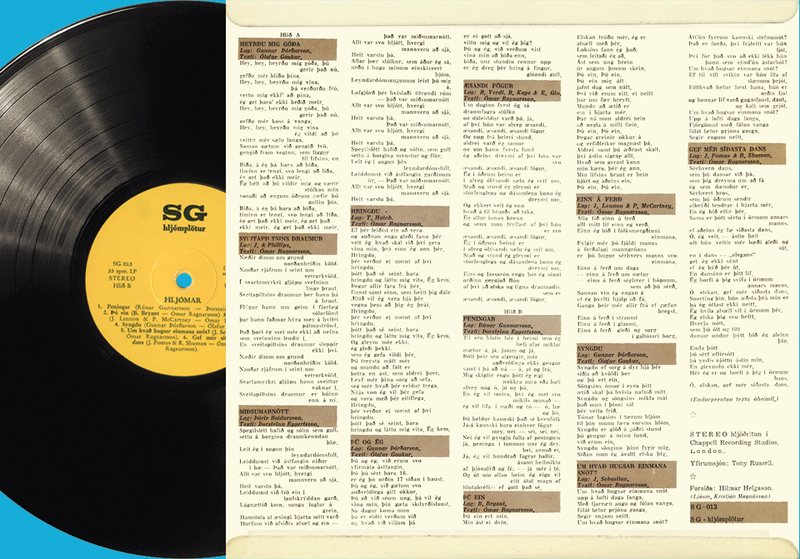 This LP was recorded in Stereo at the Chappell Recording Studios at London with the kind support of Tony Russell. Cover Art was made by Hilmar Helgason, although the photographs were taken by Kristján Magnússon. About 5000 copies were sold. 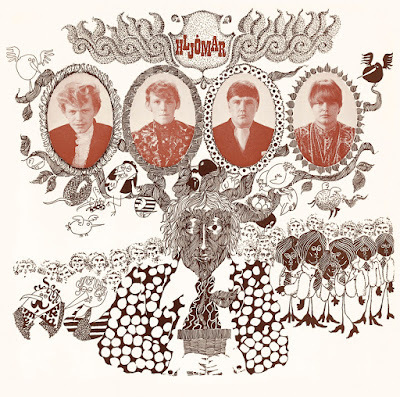 It was considered as the best album of 1967. 7 covers (with Icelandic lyrics by Ómar Ragnarsson) and 5 original Hljómar songs. Of which 3 songs were by Gunnar Þórðarson with lyrics by Ólafur Gaukur or Þórsteinn Eggertsson; 1 by Rúnar Gunnarsson with the lyrics by Þórsteinn Eggertsson (“Peningar”), and 1 by Þórir Baldursson with the lyrics by Þórsteinn Eggertsson (“Miðsumarnótt”). Gunnar Þórðarson on solo guitar, Rúnar Júlíusson on bass, vocals and backing vocals, Erlingur Björnsson on rhytm guitar and backing vocals, Engilbert Jensen on drums, vocals and backing vocals. 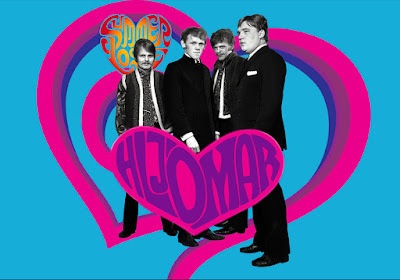 Hljómar disbanded in 1969 when Rúnar, Gunnar and Shady Owens formed super-group Trúbrot, which went on to produce more progressive music than Hljómar ever did. Seven of the twelve tracks are competent covers sung in their icelandic language. The remaining five originals are pretty worthwile too. A nice pop-sike record that will appeal fans of that genre.